The Microsoft Windows 3.0 boot screen. Now in VGA. 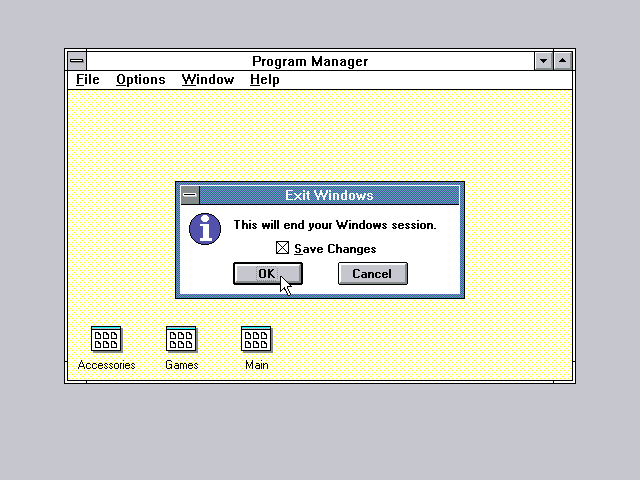 About this time Microsoft finally realized that the GUI was catching on. Functionally, the window management is not much different than version 2.x, however they took some steps to make it look fancier. Command buttons and the window controls now have a 3D look. However this 3Dnes did not extend to many other window controls. Microsoft replaced the old MS-DOS Executive with Program Manager and its companion, File Manager. Program manager gives the user large Macintosh like icons to click on to start programs. Although program groups can not be imbedded in other program groups, the icons are drag and dropable between groups. 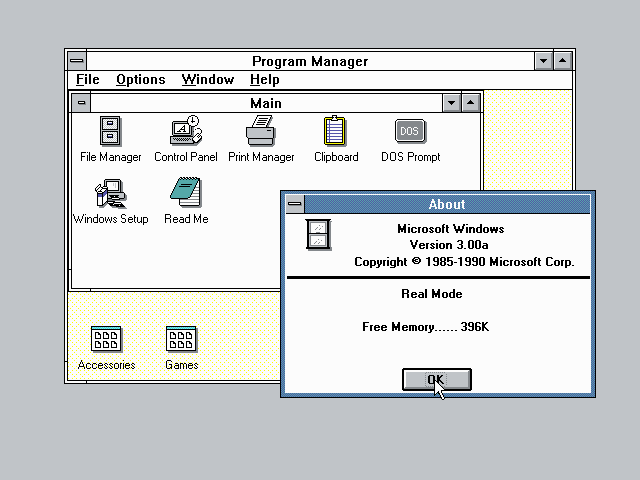 On the technical side, Windows 3.0 is capable of running in 8086 "real mode" (640k limit), 286 "standard mode" (~16 meg limit using XMS), and 386 "enhanced mode" which also allows page swapping (hard drive space is the limit). Windows 3.0 is the last version of Windows that will run on 8088/8086 IBM PC compatibles. This is File Manager. Files can be managed relatively easily with the ability to drag and drop between folders and drives. 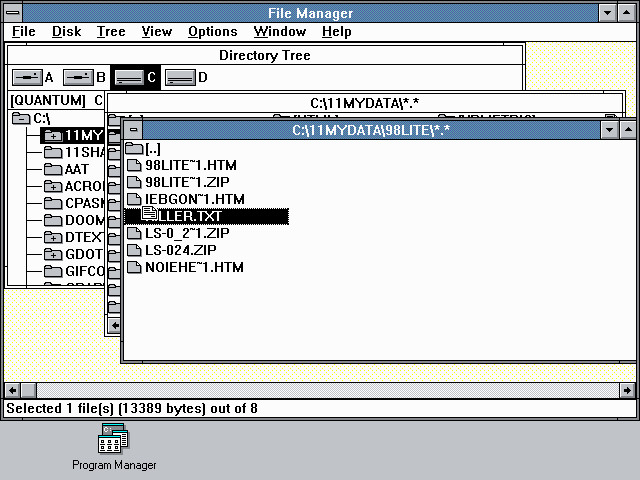 Notably, the File Manager and Program Manager are similar to those included with OS/2 1.1 a year prior to the release of Windows 3.0. 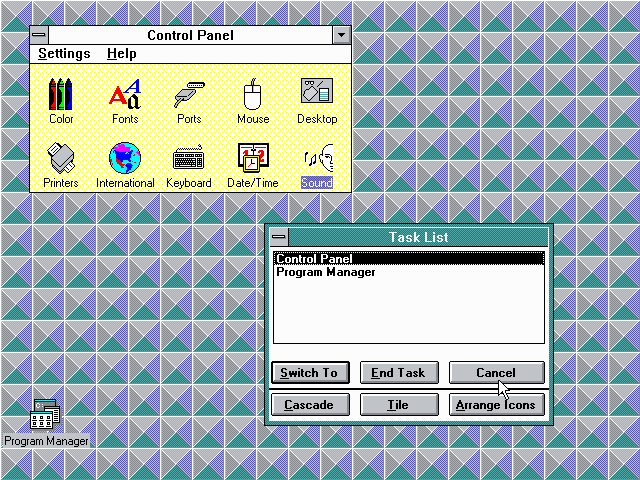 Windows 3.0 also includes a completely revamped control panel. Like Program Manager, the control panel now displays using large icons. 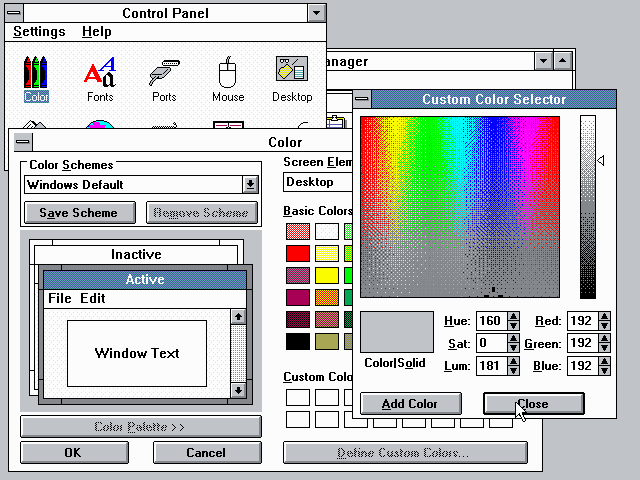 The Windows 3.0 control panel also allows you to change the background to display a specified pattern or bit-mapped graphic. Also, double-clicking on the desktop starts the Taskman program. Taskman is a small program that can be used for switching tasks more easily if many windows are open, rearranging the open windows, and rearranging minimized program icons. 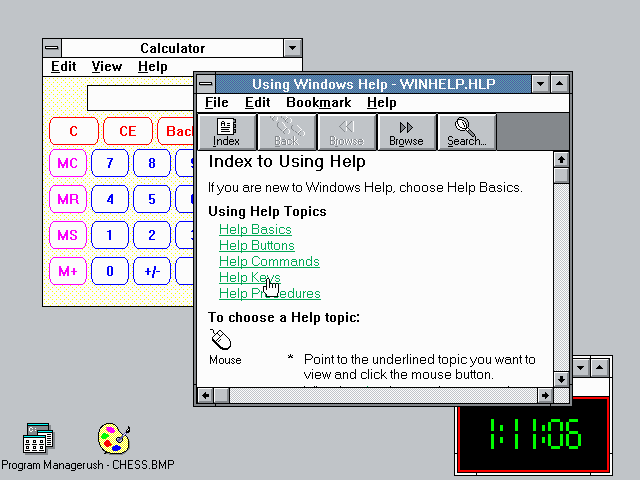 Windows 3.0 also includes a new, very advanced hypertext help system. Yes, it looks like a web browser. The Windows 3.x help files worked quite well, unfortunately Microsoft ditched this format in Windows 95, probably so they could re-introduce this very same style of help with Hyper Help in Windows 98. 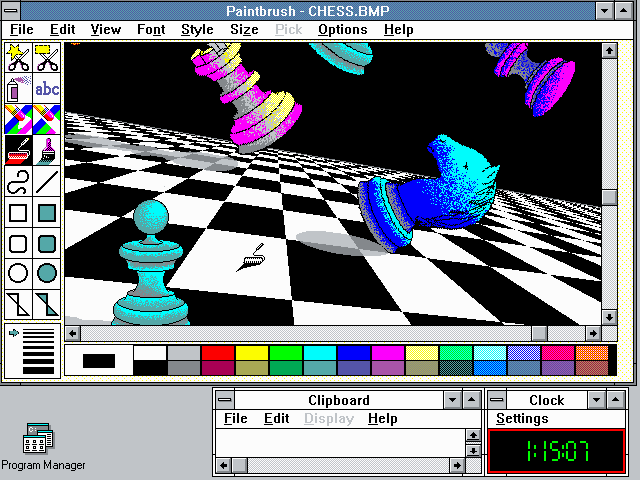 Another new application that was included with Windows 3.0 is Windows Paintbrush, a replacement for the old Microsoft Paint program in 1.x and 2.x. This program actually handles color and supports .BMP and .PCX graphics formats. 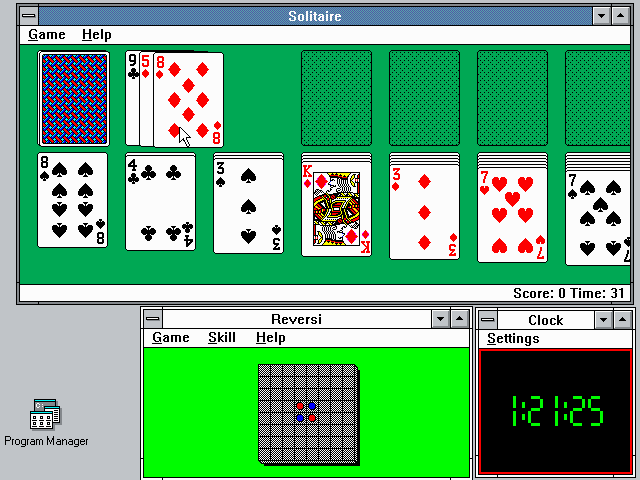 The infamous Windows Solitaire is now included with Windows!